I know that many players love this game, but I have to be honest here: I don’t like Just Jewels slots. Not the classic version and not the renewed Just Jewels Deluxe. No wilds, no bonus features, no free spins. Nothing. Don’t get me wrong – there are plenty great simple online slots that I can play for hours. I am not sure Just Jewels slot is one of them. Definitely far behind Book of Ra, Sizzling Hot and other popular Novomatic slots. Of course, that’s just my opinion, but one of the advantages of online gambling is that you can play all the slot machines for free. Just sign up to one of our top listed Novomatic casino sites and see for yourself. So far I’ve played few hundred spins and never won more than x30 my total bet. Below is the video with the best 50 spins sequel I’ve had. 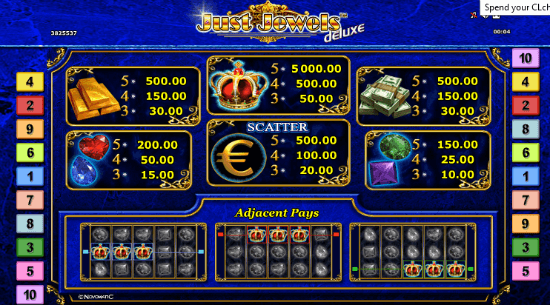 Just Jewels slots feature a common 3×5 layout with 10 paylines. We say that in case you were looking for some Bejewelled type of slots, such as Cool Jewels or Dazzle Me Slots. The highest paying symbol of the game is the Crown. If you’re lucky to get 5 of them inline you will walk out with 5,000 times your bet per line. The Euro is the scatter symbol. The only special part of Just Jewels is that you will get paid for any 3 adjacent symbols, even if they are on reels 2,3 and 4 (and not just 1-2-3). Novomatic are still in the process of adjusting to mobile and so far they’ve produced only a dozen mobile slots. Just Jewels is one of them. Actually on smaller screens, the lack of special features and visual effects becomes an advantage and the game doesn’t loose its appeal even on the smallest screens of Iphone 4. One of the simplest slots to play. All you need to do is choose the number of lines you with to play, the bet per line and hit Start. That’s it. The minimum bet per spin is 1 penny and goes up to $/€ 100 per spins, which is great for both penny fans and high limit slots players. 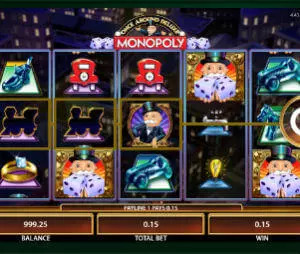 The payout of both Just Jewels slots is 95.42%, which might be good for a live casino, but is quite low for an online slot. Check our list of Best paying slots and see for yourself.